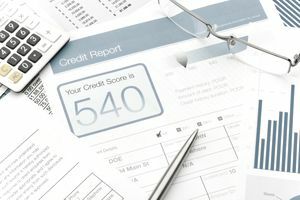 Your credit history can have an impact on a lot of areas of your life, from buying a house or a car, to getting a credit, and even when you're looking for a job. The credit check has become a measure of a person's ability to manage their financial lives and responsibilities. This may, in some cases, be an inaccurate measurement, but it is an inescapable part of modern society—even in the U.S. Military. Enlisting in the military for many people may seem like a way to make a fresh start. Unfortunately, when it comes to debt and other financial responsibilities, enlistment may not be a fresh start that is open to you. A bad credit history can affect your plans to enlist and advance in the military. If you have unpaid loans which are significantly overdue and/or in collections, you can expect to be denied enlistment until you resolve the problem. A history of bad credit could also affect your security clearance eligibility, which could make many military jobs unavailable to you. When enlisting in the U.S. Military, some recruits will have to show that they will be able to meet their current financial obligations upon enlistment. This includes recruits who are married (as well as those who are divorced); who require a dependency waiver; and those who have a history of collection accounts, bankruptcy, closed uncollected accounts or bad credit. In general, the military services are attempting to ensure that the recruit can meet current financial obligations on military active duty pay. The U.S. military is not interested in taking on new recruits that are saddled with unmanageable debts. Serious debt problems can make a person desperate for money, which opens the door to the potential for poor decision-making on the part of the recruit. This is a great concern when security clearance is in question; people have lost security clearance based on credit problems. When joining the Air Force, for example, recruits are subject to the "40 percent rule": Any recruit who's monthly consumer debts (not counting debts which can be deferred, such as student loans) exceeds 40 percent of his or her anticipated military pay is ineligible for enlistment. Navy policy considers total indebtedness, rather than monthly payments. Excessive debt obligations that exceed half of the annual salary of the pay grade of the recruit can prevent enlistment. If debt includes mortgage debt, the total debt must not be more than two-and-a-half times the annual salary of the recruit. A history of writing bad checks—unless these can be shown to be the result of bank error—canceled or suspended revolving credit accounts, repossessions and other negative credit reports may also prevent enlistment in the Navy. The Marines use the same Financial Eligibility Determination forms that the Navy uses. However, the Marines only do a financial eligibility determination when the individual requires a Dependency Waiver. As part of the Dependency Waiver approval process, the applicant is interviewed by the recruiting commander (or his/her representative) who ensures as part of the interview/review process that the recruit would be able to meet their current financial obligations on military pay. Like the Marines, the Army only does a Financial Eligibility Determination when a Dependency Waiver is required.